A few weeks ago, my friend Samantha mentioned that there was a Degas exhibit at the Museum of Fine Arts in Boston, and suggested we make the 100-mile trek to check it out. We study French together at school, and the exhibit seemed like a perfect way to expand our Francophone cultural knowledge. 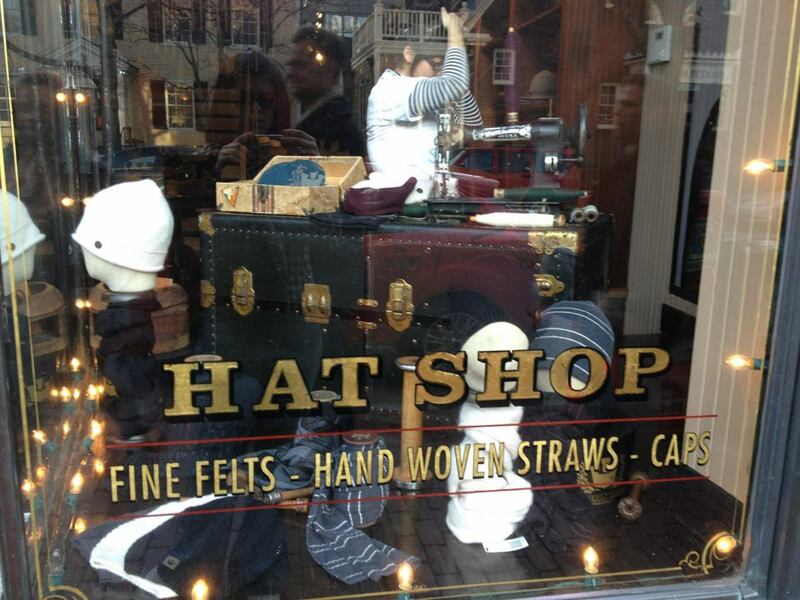 Additionally, it never hurts to head to Boston for some shopping, so we planned a day trip of French Impressionism and thrifting. 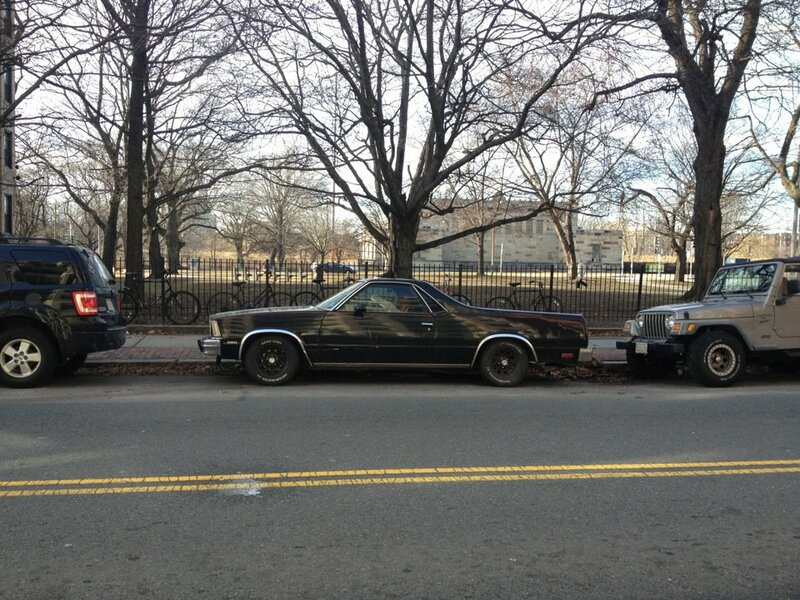 While I once lived in Boston, I never owned a car there. However, I took the wrong exit into the city and still managed to get us to our destination, then to Cambridge, and later home. For New Englanders living outside of Boston, I feel like this is an impressive feat. We never made it to a thrift store, and instead ended up at a few shops in Cambridge (which was a-ok with me, as I managed to procure a new yellow jacket for 50% off). While in Cambridge, we stopped at one of my favorite places: Black Ink. 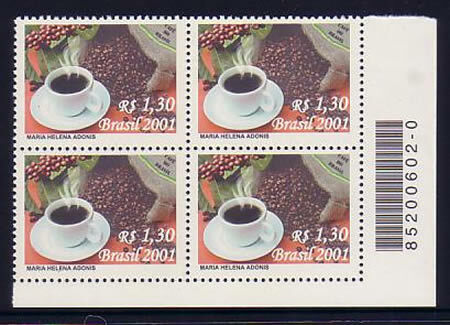 They have my favorite collection of greeting cards, and after Valentine’s Day I’ll share pictures of them. 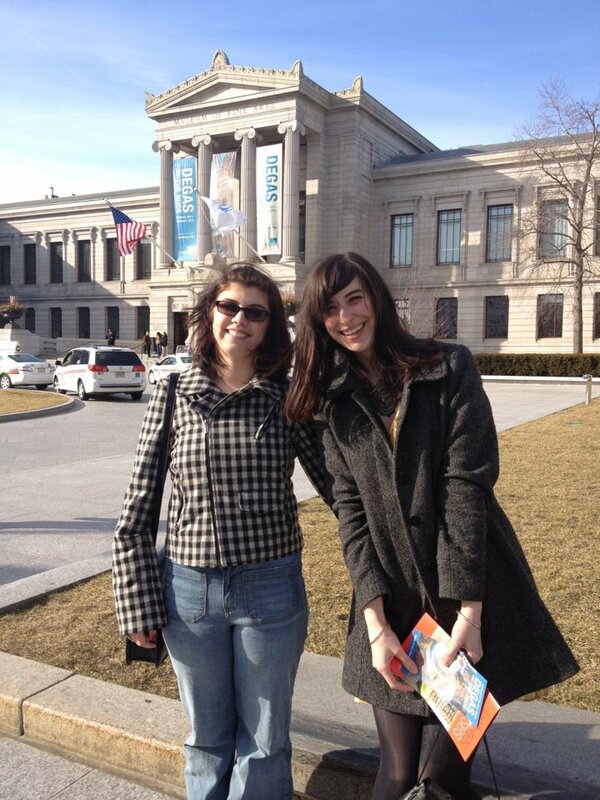 When we arrived at the MFA and flashed our student IDs at the ticket counter, we were informed that, as students in the University of Maine system, we were exempt from the $20 student entrance fee. I was astonished as the clerk explained that students at all Maine schools are provided free entrance to the MFA thanks to the Lunder Maine Student Membership Program. THIS IS GREAT NEWS! The museum is enormous and I would love to take my time exploring it. 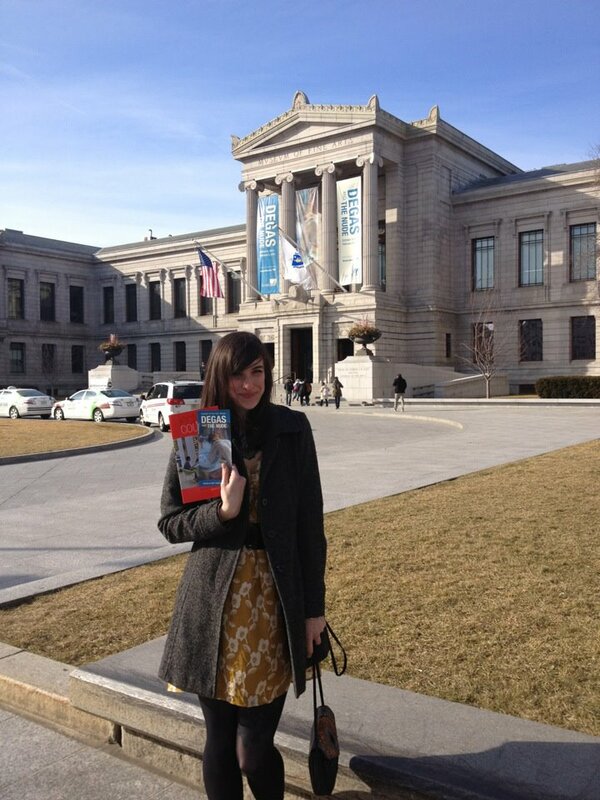 Now, when I have days off from school, I can hop on the bus to Boston and visit the MFA as many times as I’d like. 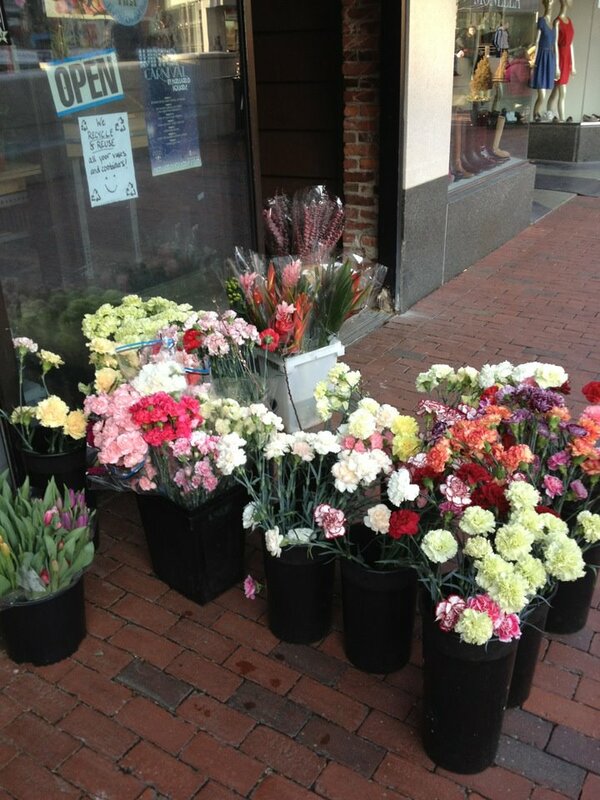 Here are the pictures from our journey, all thanks to Sam and her iPhone! (We somehow both managed to forget our cameras at home). What to do when your camera’s on the fritz? 1) Blunt-cut bangs with long hair. I’ve been growing out my locks for sometime and now that it’s long I occasionally find myself slacking in the haircut-getting department. I let my hair run wild, some days not bothering to run a comb through it at all. Lately, though, I’ve been thinking of chopping my currently side-swept bangs, and I love this lady’s look from MyNewHair.com. I have a feeling this hair-venture will make rolling out of bed and running to class look at lot better. 2) Miniature Pies. 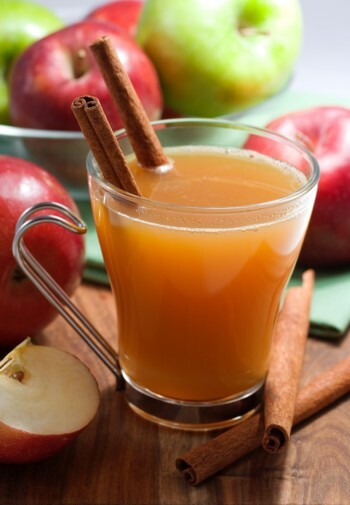 These are adorable, and don’t look particularly difficult to concoct, according to the recipe from Picky Palate. I feel like substituting different types of cookies for the Oreos could lead to very, very promising results. 3) Everything Matryoshka. My grandparents brought back lots of toys from their trips to visit family in Lithuania. One of my favorite surprises were the Matryoshka dolls. From the Russian word for mother, matryoshkas are nesting dolls, each wooden doll containing another of smaller size, and so forth. The few that I have are sets of 5 or 6 dolls in one. Lately, they’ve been popular fodder for hipsters everywhere, but their current it-factor hasn’t changed my love of matryoshkas. I have one tattooed on my left leg, courtesy of Cyndi Lou at Squid and Whale Tattoo. I was lurking the internet recently when I came across this necklace in the Poppy and Fern Etsy Shop. I might have to spring for this wee, embroidered charm. 4) Bulldog Puppies! 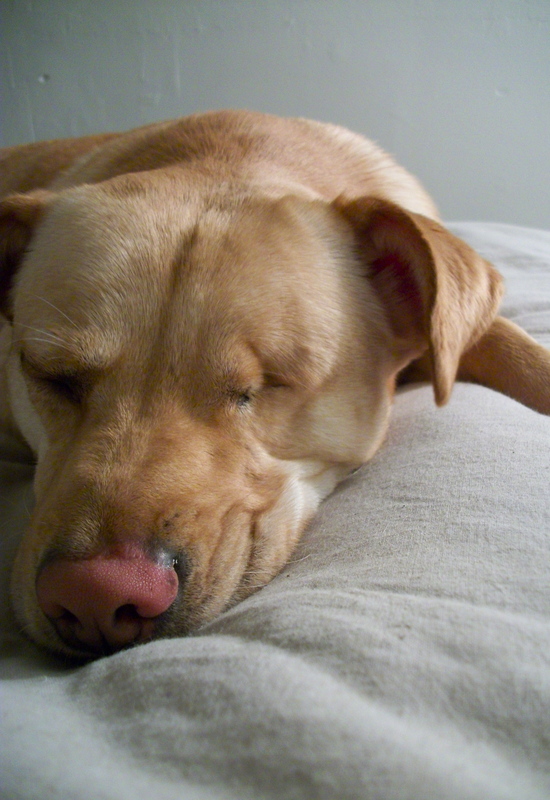 It took Josh and I hours to recover from the adorability contained in this photo found at The Daily Puppy. LOOK AT HIS FACE! 5) Little Red Riding Hood Cape. Not that I have $170 to throw around, but if I did, I might just pick up American Apparel’s wool cape (in red, of course). When shopping for Josh back in September, a clerk at a local boutique tried to convince me to buy a similar cape for nearly $400 (how he didn’t pick up on my starving-student lifestyle as I ambled about in all secondhand clothing and muddy sneakers is puzzling). So, I suppose, relatively speaking, this cape is a bargain…right? C’est tout pour aujourd’hui, mes amis! 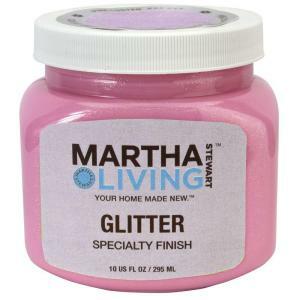 I was walking through the hardware store today, trying to find my way to the pet-friendly rock salt, when I happened upon the utmost in glorious craft supplies: Martha Stewart Living Pink Luster Glitter Paint. This is what my dreams are made of. Firstly, pink is my favorite color. Secondly, I firmly believe that all things are better when glittered. I may get some sideways glances from friends when I explain that in my heart of hearts all I really want is for my entire world to be pretty, pink, and glittery – but what is there to be excited about in life if not teeny sparkling flecks and rosy hues? 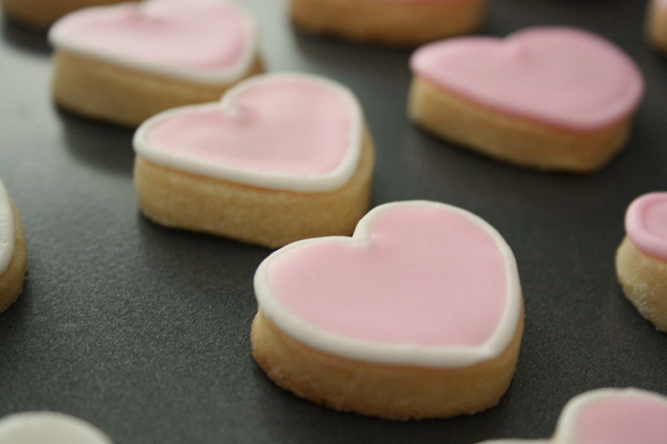 With all of this in mind, I began scouring the internet for Valentine’s Day crafting and baking inspiration. I can’t wait to start making presents for the people I love. Thus, I bring to you the notables near the shore Valentine’s Day Creativity Roundup: Part One! 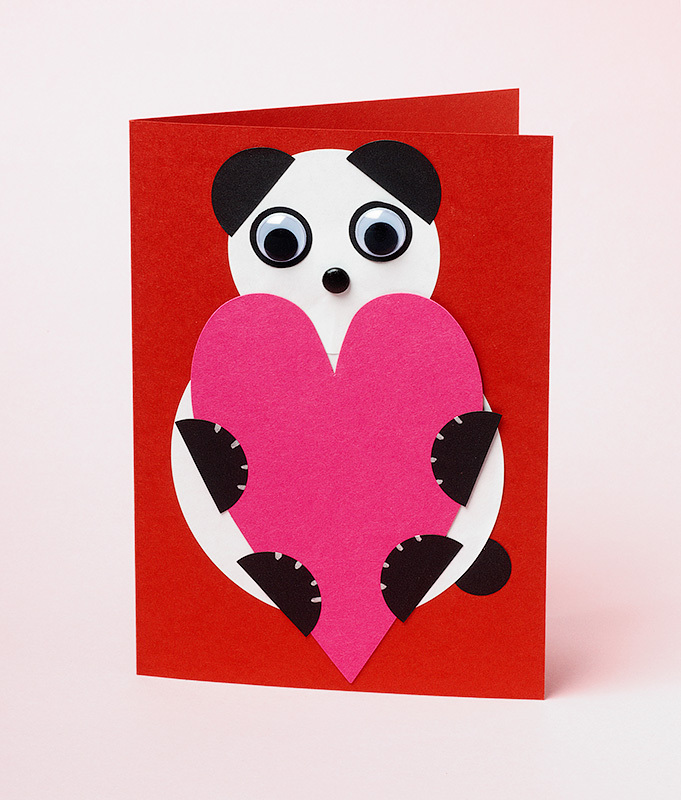 1) I love pandas and googlie-eyes, so this Valentine’s card DIY holds a special place in my heart, c/o Paper Source. 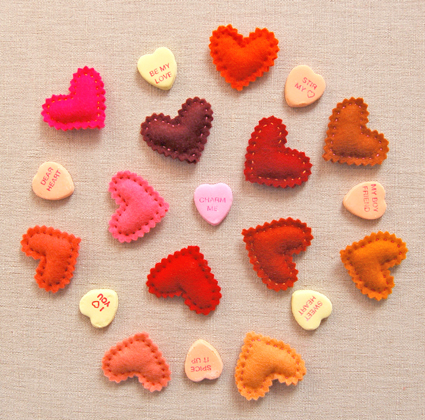 2) These tiny felt hearts are actually pins! I want to make one right away so I can make it a permanent fixture on my lapel, c/o the Purl Bee. 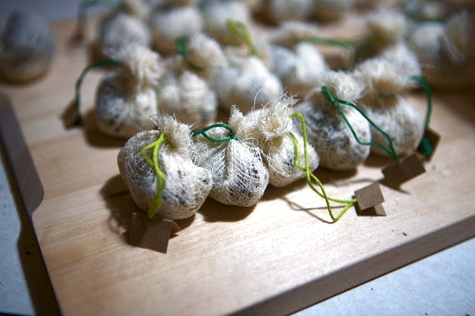 3) I desperately wanted to make poppers for New Years, but work dictated otherwise. 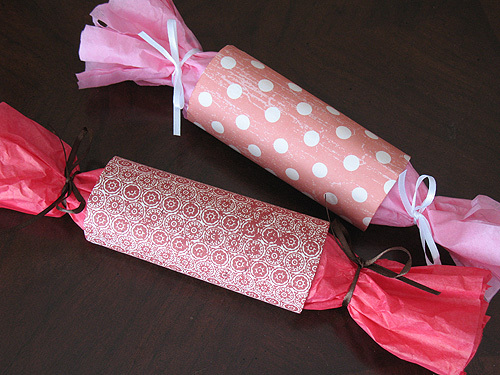 I hadn’t thought of making them for Valentine’s Day until I stumbled upon this tutorial for them, c/o CraftTown. 4) Pink isn’t the only color I’m fond of – purple is high in the ranks of my favorite hues as well. 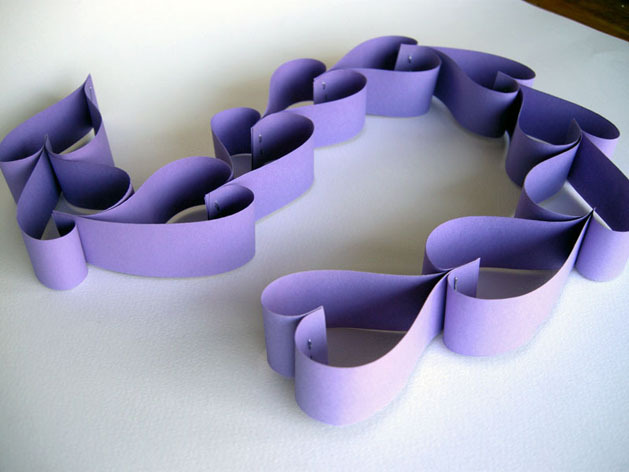 This paper chain reminds me of my elementary school classrooms during the month of February, c/o Craft. 5) Perhaps the most perfect-looking cookies I’ve ever seen. 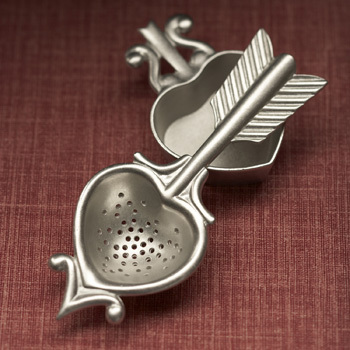 I will absolutely be trying my hand at these with the antique cookie-cutter I recently picked up, c/o Made With Love. 6) I love Mother Nature, and what better way to wish her a happy Valentine’s Day than by recycling? 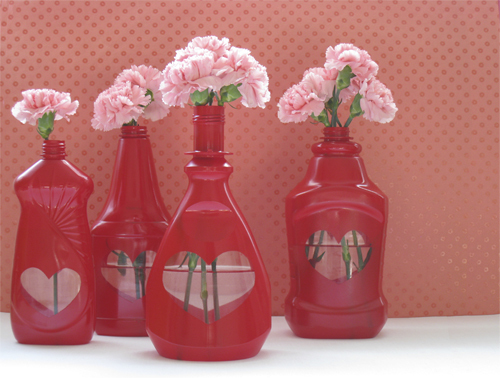 I see these upcycled vases becoming a year-round fixture in my home, c/o Canadian Living’s Craft Blog. 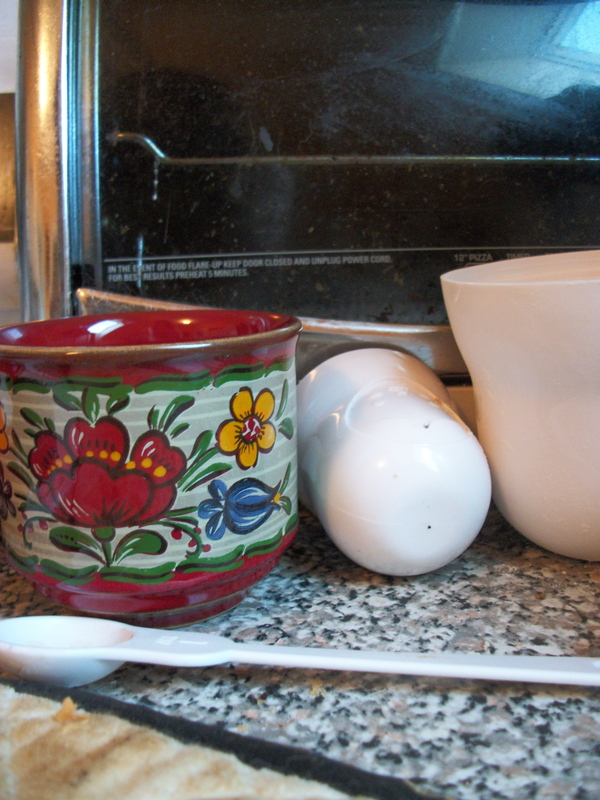 That’s all for now, and I hope to have some Valentine craft success stories to share in the very near future. 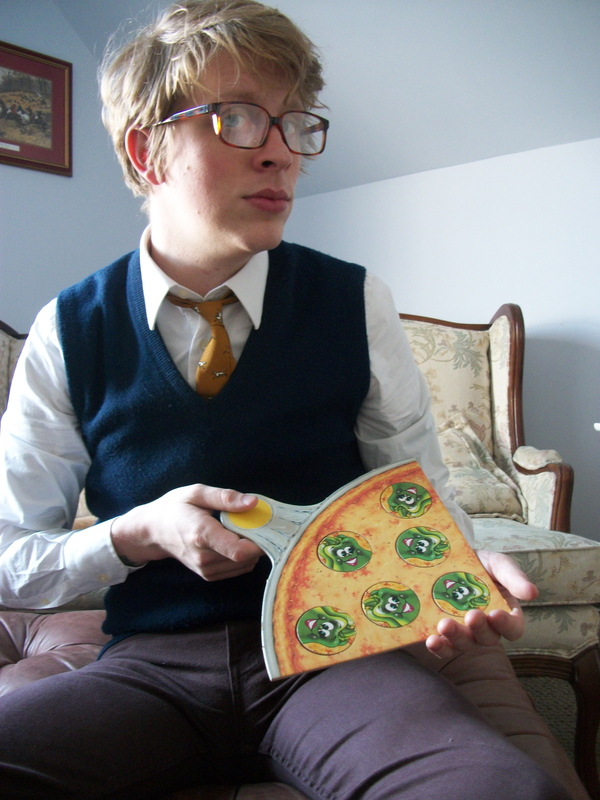 1) Anyone else love playing Pizza Party? 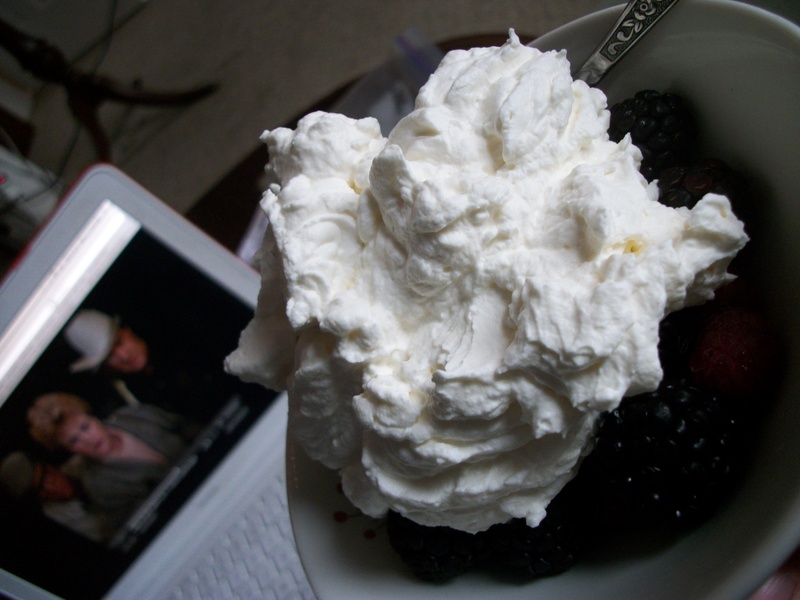 2) Berry parfaits and Murder, She Wrote! 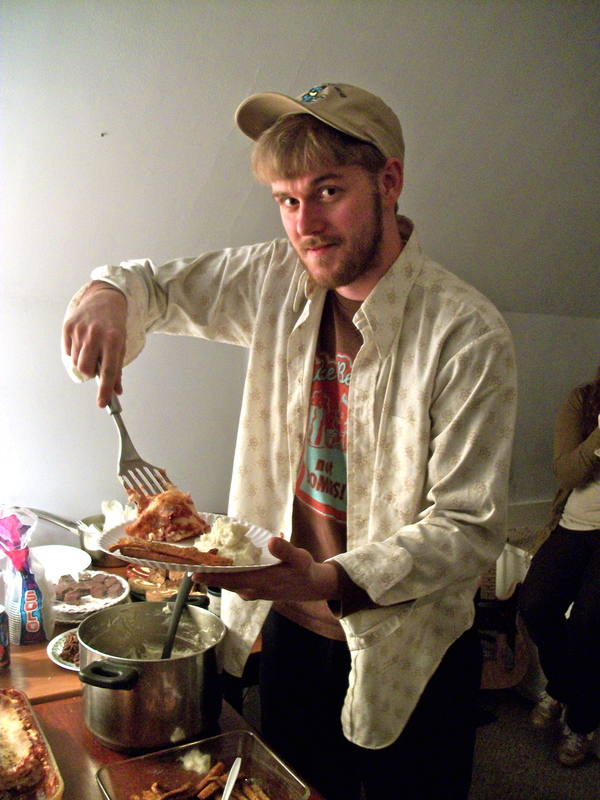 3) Our friend, Ben, preparing to chow-down on lasagna at a potluck we hosted. 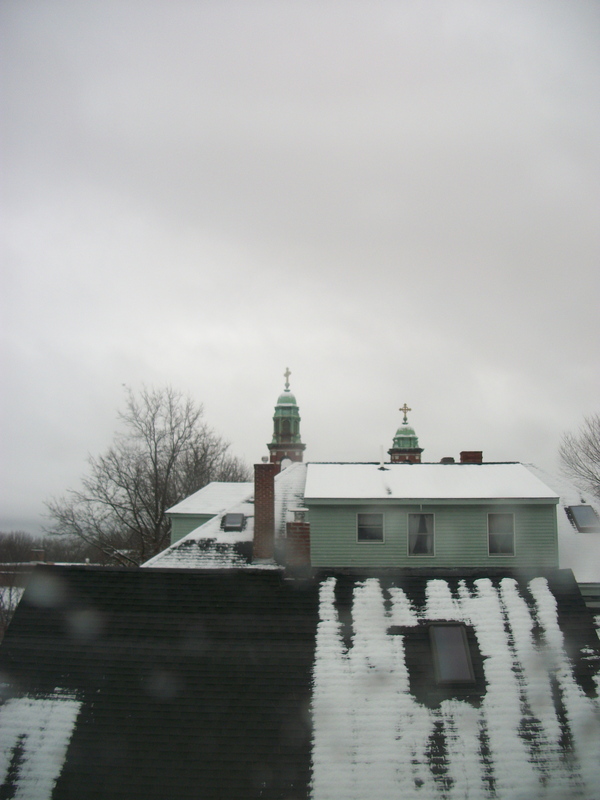 4) The snowy view from our bathroom window. 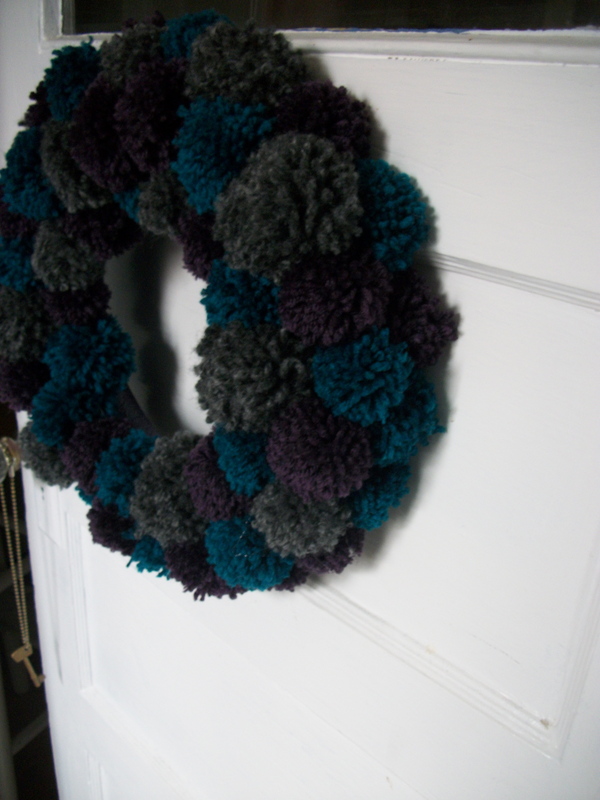 5) I made this wreath by hot-gluing yarn pom-poms to a wreath ring – incredibly simple yet effectively adorable. 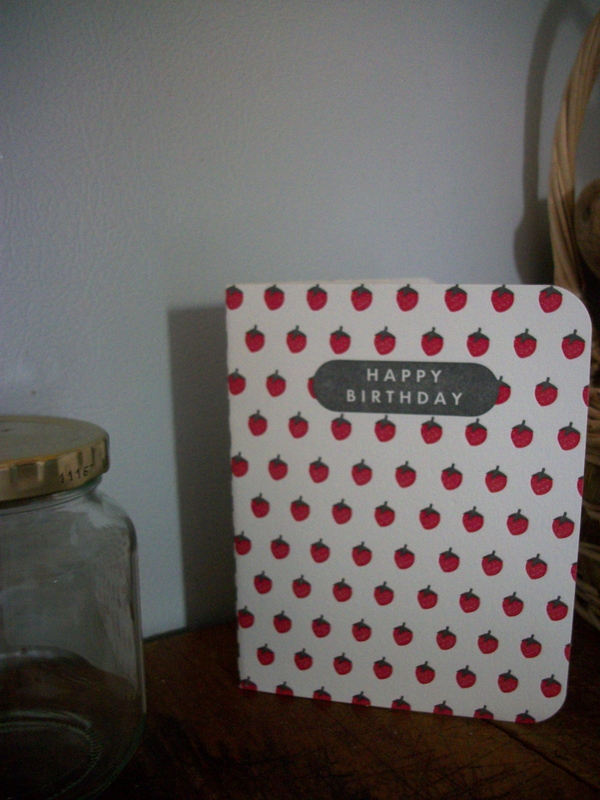 6) Perhaps the cutest birthday card I’ve ever received. 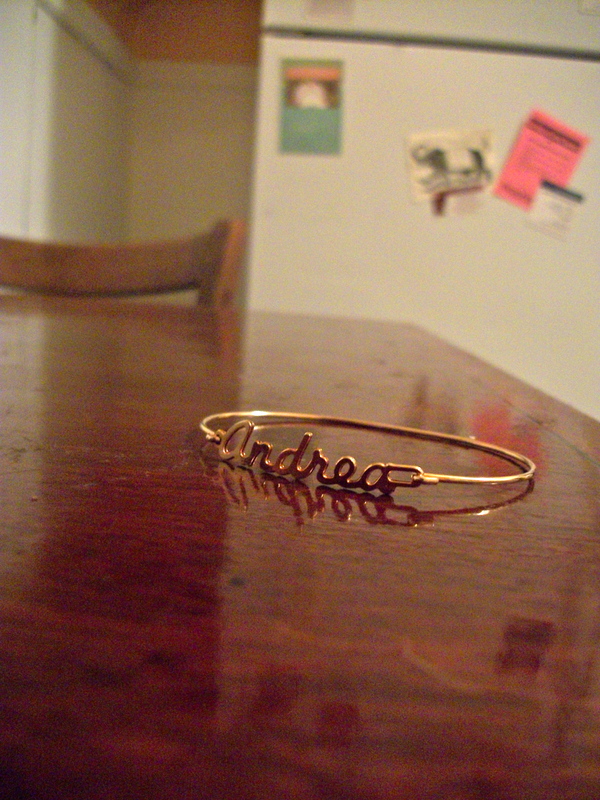 My friend Hanna gave it to me for my non-birthday, along with… 7) This perfect bracelet! 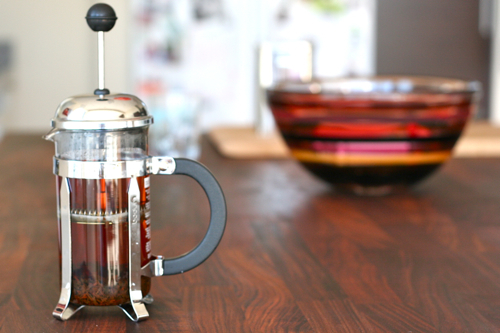 It’s one of the most thoughtful gifts I’ve ever received (thank you, Hanna – I love it!). 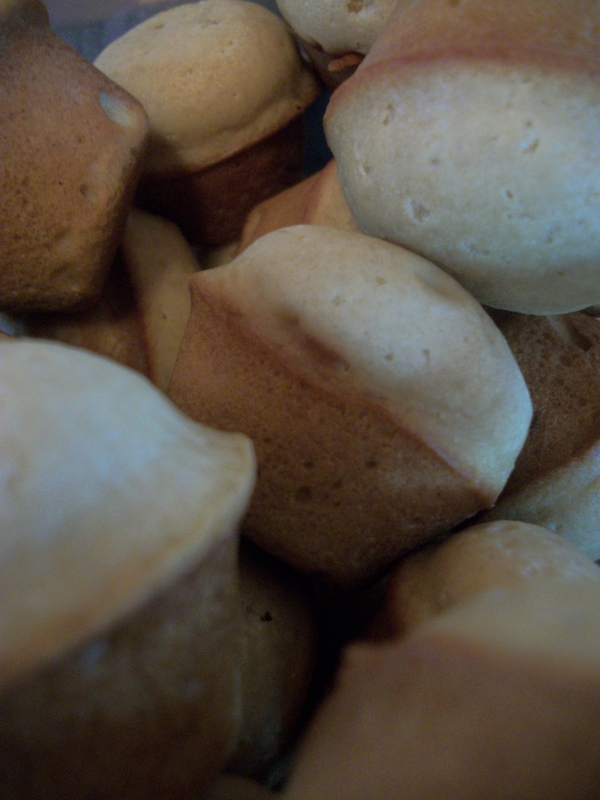 During finals week, in a fit of stress and hunger, I made the most delicious muffins. I feel like the term “muffins” is a misnomer, however, and a more apt name would be “Bite Size Mouth Sunshines” or “I Can Now Die Happies”. 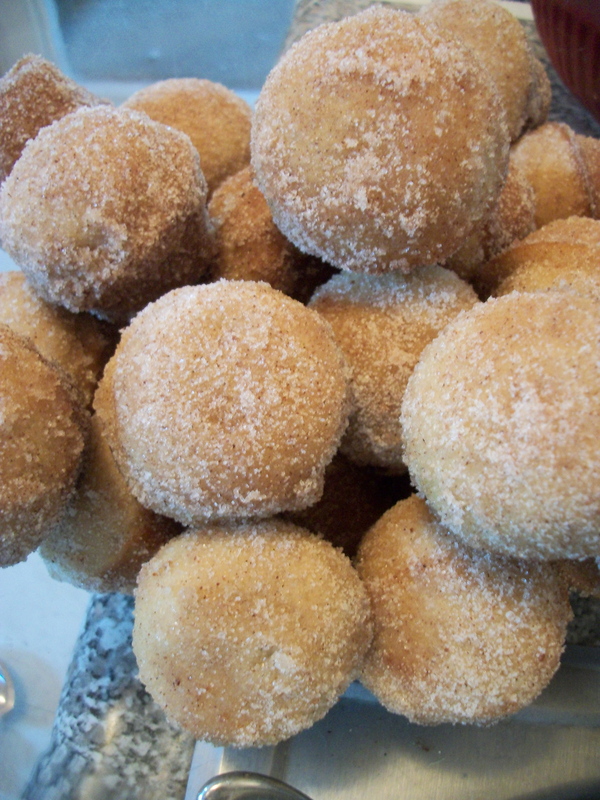 Whatever one calls them, these butter-soaked, sugar-coated muffins are delicious and make me happy during even the bleakest hours of studying. 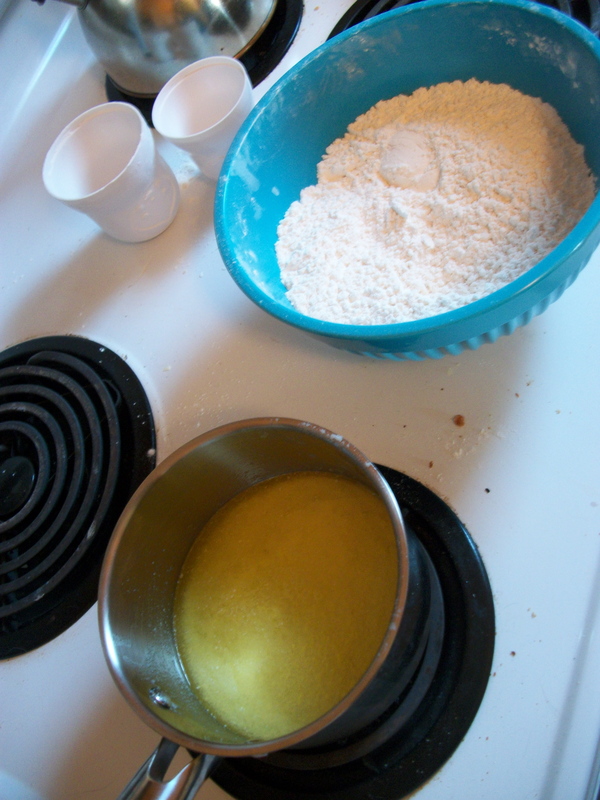 I adapted my version from this recipe. 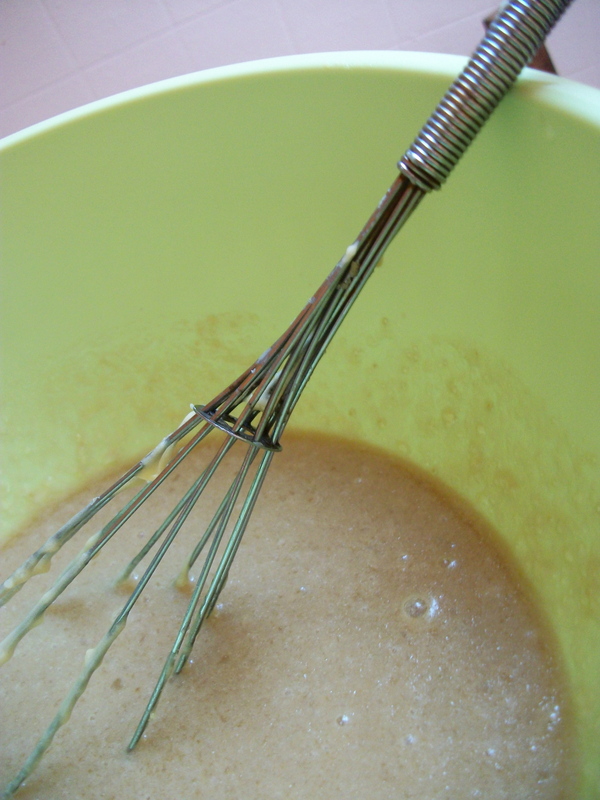 In my version, I added nutmeg to my cinnamon/sugar mix, then using easily 10x as much of the stuff than the original recipe called for. Oh, and I required far, far more butter than was used in the original recipe – I estimate that I used somewhere in the 3 1/2 sticks ballpark.